An early birthday present from Dad! First, let me tell you the most exciting news. Yesterday I was hanging out at a grocery store deli and ran into a cool person who has been reading the blog. He recognized my face from the blog and remembered reading references to Cedar Rapids. This gentleman has a strong background with car dwelling and sent me some excellent pictures as well as his story. I replied with an email and, if he gives his consent, his material will be published here. I think the readers will find it motivating and inspiring. He sure inspired me! I’m already thinking about removing and storing the passenger’s seat of the Impala so that it would be more affordable to travel north to Decorah and do some trout fishing and biking. Thanks to the new friend for the motivation! In other news, I was headed back from Decorah on the last long trip and the alternator started making painful noises… screeching like a long tailed cat in a room full of rocking chairs. I figured it was the alternator bearing and that was correct. But in the meantime, the tension adjuster pulley needed replaced. While things were torn down, I replaced the idler pulley, too. I was telling Dad about it and he kindly offered to buy me a $139 alternator for my November birthday present. Since Dad is in a care facility, I had to run this past the attorney and he was cool with it. THANKS DAD! What an awesome Dad and incredible gift! If there is one piece of advice I would give, it would be not to become intimidated by working on a van. 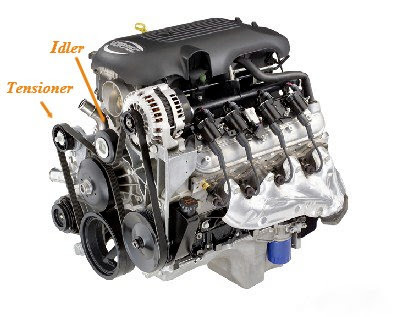 If you pull the overflow tank and air cleaner, you’ll be amazed at how easy it is to change a Chevy alternator. Don’t think so? 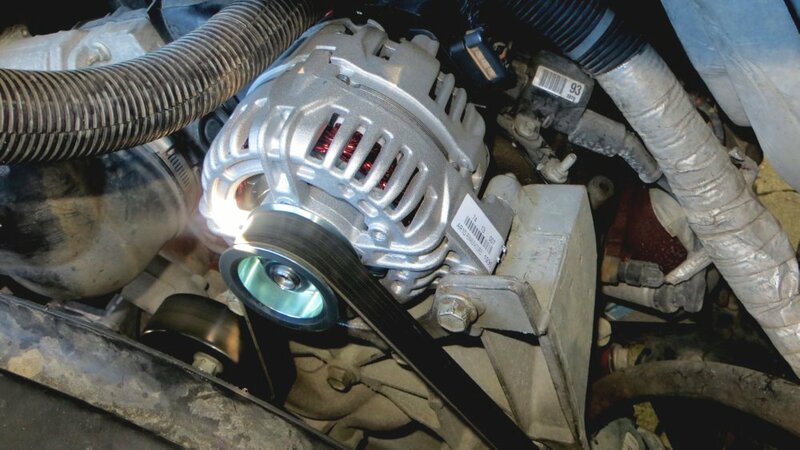 Try changing anything on a front wheel drive car and you’ll love working on the van! On the health front… Vegetarian for two days? Well, almost… In speaking with a friend on Facebook, the subject of fruits and veggies came up. I told my buddy Scott I would try and do a vegetarian diet for 2 days… It went very well although the last few hours of the 48 hour period was during the alternator replacement (in 92 degree weather). I ended up having a couple of cheeseburgers in the waning hours… That’s okay. It illustrated that at least one or two meatless days do make a difference. Watch for more vegetarian recipes on the recipe blog. Here is one of the dishes that made this effort fun! Creamy Crimini Pasta. Do I still want to go meatless now and then? Sure! Today’s lunch will likely be a veggie burger at Burger King. It is possible to start developing new habits. Is it true that the Diet Coke addiction has been broken? Basically, YES!!! Once the railroad van driving job folded, so also did the 2 gallon a day Diet Coke habit. Drinking that much caffeine was the only way I could function (without taking some kind of “speed”!) with 3 hours of sleep before 200 mile unplanned trips. Toward the end of that job, I was choking and throwing up food ’cause the soda was eating up the digestive system. 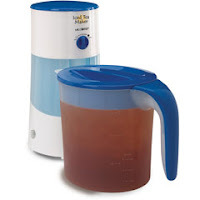 As a lover of unsweetened tea, I thought why not try an iced tea maker? I bought a Mr. Coffee model (there are better ones out there but this thing works and it’s cheap) and have been making batches of unsweetened herbal tea every day. It’s caffeine-free and the fruity taste / smell satisfies the need for something sweet. The best thing is that this tea is packed with anti-oxidants and actually good for you… not to mention it’s cheaper, too. Future plans involve freezing bottles of iced tea to use for chilling food as well as for consumption while taking van trips. For now I make a 2 quart batch each day and chill it in Dad’s freezer. There is more to share but I think it will wait for another posting. The Impala is going in for an oil change in a few hours… I am going to clean it out and get it ready for a car camping trip to Hill Country… The bike rack is already on the back and the weather is gorgeous. Maybe today will be the day to finally hit that Prairie Farmer bike trail in the town of Calmar… and for a lot less gas. Thanks to Curtis Carper – www.stealthvandweller.com and the new buddy Ryan, for giving me some motivation to car camp for fun… It is going to add a whole new dimension of fun to this year’s outdoor activities and will help keep the cost down, too! Stay tuned… I’m sure there will be some cool pictures coming the next few days… and some fishies to cook up, too. Take care! Go have fun today!